The Boston Celtics and the Los Angeles Lakers are the two most storied franchises in the NBA. These two teams have a combined 33 championships and dozens of Hall of Famers. Now, they are in a rare position of drafting No. 1 and No. 2, respectively, in the 2017 NBA draft. Boston is coming of a season in which it finished first in the Eastern Conference and reached the conference finals before losing to LeBron James and the Cleveland Cavaliers in five games. The Celtics are in need of frontcourt help, but they could bolster their talented backcourt with another playmaker. The Lakers are in the midst of their worst four-year run and coming off a 26-win season. L.A. has already gone through a major shakeup in the front office as Hall of Famer Magic Johnson takes over the reigns as head of basketball operations and added Kobe Bryant’s agent, Rob Pelinka, as the team’s general manager. The Lakers badly need a leader and face of the franchise, and they could pick one up in this year’s talent-rich draft. Scouting report: Lonzo Ball may wear No. 2 but he’s by far the No. 1 player in the draft. Thanks to his very opinionated father, Lonzo, 19, is the most highly publicized prospect in the draft. Whether he likes it or not, Lonzo is under a brighter light that any incoming NBA player but he seems to be unfazed by all the extra attention. Ball’s strengths far outweigh his weaknesses. Unlike the new breed of superstar point guards today like Steph Curry, Russell Westbrook and Kyrie Irving, Lonzo is a pure point guard. The Chino Hills (Calif.) native almost a throwback from the days when point guards were not the leading scorers. Ball led the NCAA in assists (7.6) in his one-and-done year in college, and he led UCLA to 31 wins and a berth in the Sweet 16. About the only knock on Ball — outside of daddy’s bombastic approach — is his unorthodox shot. But most teams say it’s not too big of a concern as long as it goes in. Contrary to popular belief, Ball is a very capable defender who rises to the challenge. Look at video from his matchups against Arizona’s Allonzo Trier and Oregon’s Dillon Brooks. Prior to Ball’s arrival in Westwood, the Bruins were 15-17 and missed the NCAA tournament. Ball not only changed the culture at UCLA but he also upgraded its style of play. Ball helped orchestrate the most explosive offense in college basketball, a fast-pace style reminiscent of the Showtime Lakers in the 1980s led by Magic Johnson. Ball is a special player with a unique skillset. It would be extremely hard for Magic and Pelinka to pass up on a local kid with star potential. If he comes close to living up to the hype his father, LaVar, has been preaching for months then Showtime is about to be unleashed at Staples Center. Scouting report: The 19-year-old Duke product could be the most versatile player in the draft. He can play all five positions, and handles the ball well for his size. He’s a natural small forward but can play power forward when teams downsize. He stands 6-8 but has an impressive 6-11 wingspan. Some scouts already view Tatum as a finished product. He may not be an explosive athlete, but he’s a smooth player who rarely plays out of control and has an array of offensive moves when isolated at the elbow. He only shot 36 percent from behind the 3-point arc, but with practice he could develop into a good long-range shooter because his form is exceptional. He has an advanced midrange game to go along with his ability to finish at the rim. Tatum’s draft stock soared when Duke made it’s incredible run during the ACC tournament. Tatum was a major force in the tournament, showing scouts what he’s capable of in the clutch when he took over the final two minutes of the ACC title game by having a hand in Duke’s final 10 points. The one knock on Tatum is his defense. He may struggle defending power forwards and quicker small forwards. Scouting report: Fultz, 19, is the consensus No. 1 pick in almost all of the mock draft boards, but OMFB has some concerns about his one season at Washington. Sure, he put up gaudy numbers (23.2 points, 5.7 rebounds, 5.9 assists), but the Huskies won just nine games and lost 22. That is a serious red flag. If the former DeMatha High School (Md.) standout is a can’t-miss prospect who could be the face of an NBA franchise, then why did his college team had such awful record and did even make the NCAA tourney? That is a question NBA general managers must ask when evaluating Fultz. The measurables are there. He’s got great size and strength for a playmaking guard, and has all the skills to be a dynamic scorer in the NBA. He has a ridiculous 6-9 wingspan, which helps him finish at the rim. He’s quick enough to get by most defenders and has enough range to shoot threes. He already has a Euro step to go along with his mid-range game. In his lone matchup with Lonzo Ball in the Pac-12, he scored 25 points on 9-of-19 shots from the field, grabbed six rebounds, dished out five assists, and knocked down five 3-pointers. But Washington got destroyed 107-66 in Seattle. Ball had 22 points with six rebounds and five assists. A statistically draw between Fultz and Ball, but Lonzo’s team came away with a blowout win. Scouting report: No college team pumps out more NBA-ready guards than Kentucky, and De’Aaron Fox is the latest in a long line of former Wildcats joining the Association. Kentucky coach John Calipari said the 19-year-old Fox “is going to be great at the next level.” Calipari added: “De’Aaron’s speed, length and ability to pick up defensively from 94 feet set him apart from his peers.” Fox is an ultra-quick guard who belies his wiry frame. He has John Wall-type end-to-end quickness that most NBA teams covet. He may not have a deep range on his 3-ball, but he can get to the cup almost at will and able to finish or draw fouls. He may not be John Wall yet but he’s comparable to another speedy lefty guard: Memphis Grizzlies point guard Mike Conley. Conley’s jumpshot is nowhere near where it is now compared to when he first entered the league, so Fox could use Conley as a barometer. 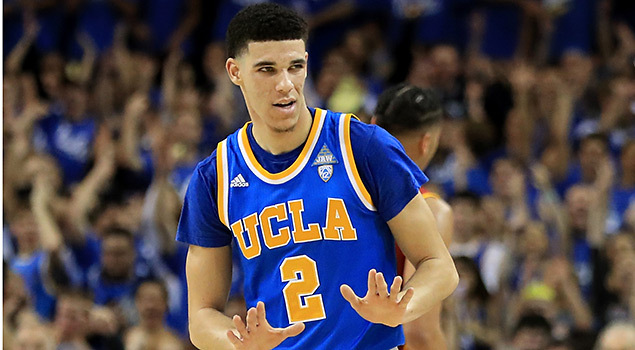 Fox’s draft stock rose when he outplayed Lonzo Ball in the Sweet 16 of the NCAA tourney. Fox scored 39 points and he looked like the best player on a court filled with pro prospects. The biggest knock on Fox, aside from his poor shooting range, is his recklessness. He tends to play at one speed and can get into trouble when he over dribbles. But most league execs will put up with his lack of discipline because you can’t teach speed. Scouting report: The 20-year-old Kansas forward is an explosive, quick-twitch athlete who could become a solid two-way player in the NBA and most likely the next slam dunk champion. He has the size and quickness to matchup with any position except center. Jackson’s high motor and competitiveness are his greatest strengths, and has the potential to be an elite defender. He can play straight-up man and plays the passing lanes extremely well. Offensively, Jackson is somewhat of a mixed bag. He struggled early on before correcting his shooting woes during the latter part of the college season. He finished with a decent field-goal percentage (51 percent) and averaged 16 points per game. But one glaring stat on Jackson’s stat sheet is his free throws. He shot a mind-boggling 56 percent from the line, which leads many scouts to question his ability to knock down open jumpers on a consistent basis. Some draft boards have Jackson as high as No. 2 to the Lakers. But that’s a bit of a reach considering Jackson’s skillset is not truly off the charts. He’s a good athlete who could become a solid NBA starter, especially if he improves his outside shot. Scouting report: The Arizona forward is very intriguing. Markkanen didn’t dominate the Pac-12 conference but scouts love his game. The big man from Finland has — dare we say — Dirk Nowitzki-type talent. He is the ideal stretch 4. Markkanen averaged 15 points per game and shot 42 percent from 3-point range in his lone season for Sean Miller’s Wildcats. He may not turn out to be Dirk but he could be a really good NBA forward with great potential. Markkanen is a pure shooter who can play power forward or center. Markkanen is a great fit in today’s NBA in which big man are now asked to float around the perimeter to space the floor and allow more dribble penetration by the guards. “For him not to be considered as one of the best freshmen in college basketball is a complete joke,” Miller said. “I will put him up against anybody, not just freshmen, toe-to-toe the quality of player he is. I don’t care if you’re from Russia, China, Finland, Japan, North Dakota, Florida, or New York City. If you have eyes and have seen Arizona play, there aren’t many players that play the way he plays.” We couldn’t have said it better. Whomever drafts Markkanen won’t be disappointed. Scouting report: When 22-year-old Jackson tested the NBA waters last spring, evaluators said he needed to improve his shot. He was a good player, but he needed to become a better threat from beyond the arc. So Jackson went back to UNC to work on his shot. The extra work paid off as he turned into a more than capable outside shooter on a national championship squad. Jackson made over a 100 threes during his junior season. He made just 63 total in his first two seasons at Chapel Hill. He averaged 18.4 points per game and also did great work on the defensive end. Jackson could end up playing the 2 or 3 spots at the next level. What may set him apart from the other prospects is his college resume. He’s a flat-out winner. Jackson came within one miracle 3-pointer by Villanova’s Kris Jenkins from winning back-to-back NCAA championships.